STS President and CEO Monica Smith presents Dorothy Hardman Spirit of STS Award to SRC Inc. CEO and owner Bill Chapin. 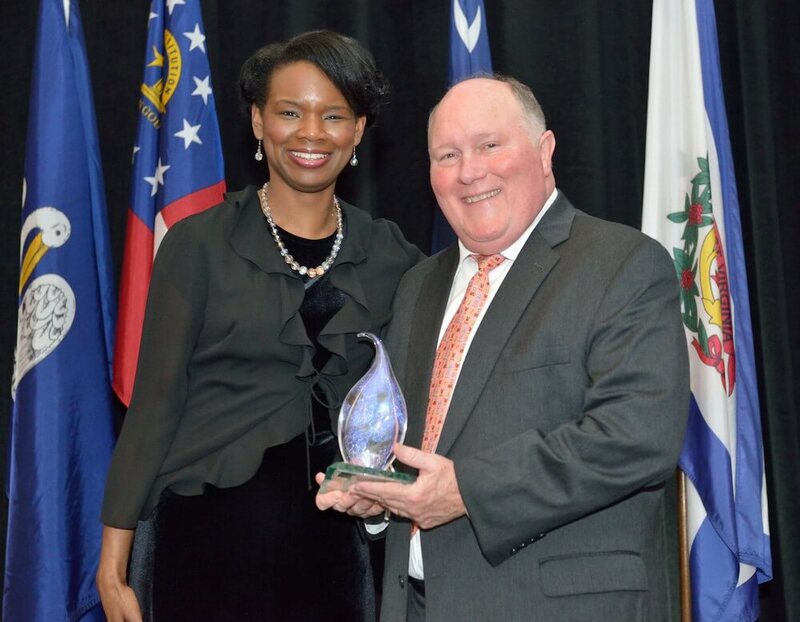 Credit: SRC Inc.
DAYTONA BEACH, Fla. — CEO and Chairman of the Board Bill Chapin of See Rock City Inc., was honored by Southeast Tourism Society with the Dorothy Hardman Spirit of STS Award at the annual Shining Example Awards in Daytona Beach on March 20. This award honors a recipient whose devotion to the industry matched that of the person it was named after. Rock City Gardens, the most known property within the SRC hospitality company, opened to the public on May 21, 1932, and has consistently maintained its mission to create memories worth repeating for its guests and partners under Chapin’s leadership. He became a third-generation owner of Rock City in 1985 when he purchased the attraction from his father. Chapin had also followed in the entrepreneurial footsteps of his great aunt and uncle, Garnet and Frieda (Utermoehlen) Carter, Rock City’s founders, as he paved the way for more properties to be added to SRC. Multi-million dollar renovations have been made, as well as an expanded annual festival and event lineup in the last decade. Headquartered in Roswell, Georgia, STS is an association that works to unite all segments of the travel and tourism industry through its four pillars of education, advocacy, recognition and networking. Established in 1983, STS is an engaged network of 1000 plus members from 12 states: Alabama, Arkansas, Florida, Georgia, Kentucky, Louisiana, Mississippi, North Carolina, South Carolina, Tennessee, Virginia and West Virginia. For more information, visit www.southeasttourism.org. SRC Inc. is a hospitality and entertainment company that features world-renowned Rock City Gardens high atop Lookout Mountain, just 6 miles from downtown Chattanooga, Tennessee. Rock City is one of the South’s most popular natural attractions, known for its seven states view, unique geological and botanical wonders including massive ancient rock formations, a 140-foot waterfall that cascades down the mountain and the Swing-A-Long Bridge that spans nearly 200 feet. SRC Inc. also owns and operates the Battles for Chattanooga museum, Starbucks, the Incline Railway concessions and ticketing, RiverView Inn and Grandview Conference Center on Lookout Mountain, as well as Clumpies Ice Cream Co. in Chattanooga and Blowing Springs Farm in Flintstone, Georgia. Visit www.seerockcity.com for more information.